The state of our union is polluted. 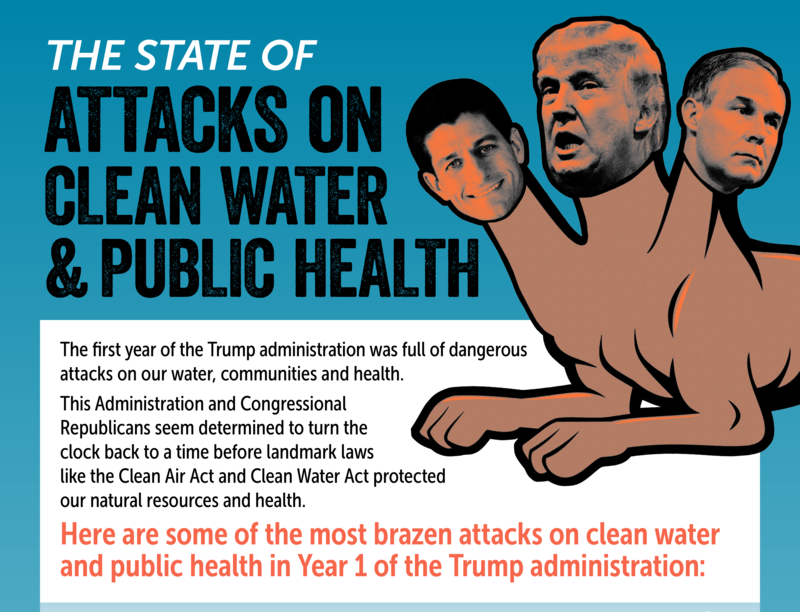 President Trump, Congressional Republicans, Scott Pruitt and other cabinet members spent the first year of this dirty water presidency rolling back protections for public health, jeopardizing communities, and putting corporate priorities first. Scott Pruitt's EPA is in the process of canceling more than 60 environmental safeguards and dedicated career staff and scientists have been pushed out. In early 2017 Congress used an obscure tool, the Congressional Review Act, to undo rules to fight corruption in the oil and gas industry, allow coal companies to destroy streams with waste from mountaintop removal coal mining, and allow hunting by helicopter in the Alaskan wilderness, and more. Proposed budgets from the President and Congress call for devastating EPA, drastically reducing staff and slashing funding for programs that help states protect clean water, They would cut funding for the cleanup of vital watersheds and would making it harder for EPA to monitor emerging threats to public health and the environment. The state of our union is corrupt. In 2016 the oil and gas industry spent more than $103 million to elect politicians who would do their bidding. In the first quarter of 2017 the industry increased their spending on lobbying by 75%. The return on investment for them has been huge. Beyond the repeal of rules to prevent corruption, Congress tried to roll back rules that limit methane flaring and leaking by oil and gas companies on public lands, and used its tax scam to give the industry the prize it has wanted for decades - drilling in the Alaskan National Wildlife Refuge. The Trump administration has joined Congress in making sure that the fossil fuel industry and other special interests get what they want. Corporate shills now fill vital positions in agencies like EPA and the Departments of the Interior and Energy where they oversee the industries they used to work for. The Department of the Interior proposed shrinking several national monuments like Bears Ears and Grand Staircase Escalante in Utah, two historically and geologically important areas that just happen to contain oil, gas, coal, and uranium. Interior also proposed selling off 95% of our coasts to the oil and gas drilling to allow offshore oil drilling. At the Department of Energy, much of Secretary Rick Perry's agenda comes right out of Murray Energy's wish list. To top it off, Scott Pruitt and Ryan Zinke were caught wasting taxpayer money on private plane rides, 1st class flights, and helicopter rides. The state of our union is opaque. The Trump administration doesn't want the public to know what it's up to our which corporate interests it is serving. It has restricted the release of White House visitor logs. Scott Pruitt wasted taxpayer money installing a secret phone booth and sweeping his office for bugs. EPA won't release his schedule and he is avoiding the press at all costs. Pruitt also appeared in a propaganda video for beef lobbyists, encouraging people to support repealing the Clean Water Rule months before he returned to Congress to answer questions in public. He has also been restricting press access to his public events whenever he can. Meanwhile Republicans in Congress want to help Scott Pruitt violate the law and gut protections for drinking water in secret. They are using the budget process to pass an amendment that would let EPA ignore basic regulatory requirements -- such as considering public comments, as they work to repeal the Clean Water Rule. Agencies are supposed to listen to the public, and justify their rules. Congress and Pruitt are attempting this end-run around the law because there is no justification for canceling drinking water safeguards.. The state of our union is in denial. Scott Pruitt convinced President Trump to announce that the U.S. would leave the Paris Climate Accord, ceding our global leadership on clean energy and climate. President Trump ordered EPA to repeal the Clean Power Plan, our most significant existing climate policy. Pruitt personally ordered the removal of climate change information from EPA's website and sows doubt about whether humans cause climate change. Despite storms like Maria, Harvey, and Irma, and wildfires in the West, this administration has its head in the sand and pushes a dangerous, pro fossil fuel agenda. But the state of our union is also active and engaged in the fight to protect public health and the environment. The first year of Trump's dirty water presidency helped to mobilize millions upon millions to the streets and the ballot box, from the first Women's March to the People's Climate March to the most recent Women's March, to the election of pro-environment candidates in New Jersey, Virginia and Alabama. People see through the pollution, corruption, and denial; we are opening closed doors and exposing what's happening. It might not be easy. It might seem impossible at times and it's going to be ugly too. We're not going to win every fight. But we're going to make sure Trump and Pruitt and their cronies in Congress lose their share of fights and, ultimately, their jobs.